We love wood counters at our house. They are classic, provide a warm, homey look (usually contrasted with white beadboard! ), and – most importantly – are inexpensive. So we were pretty happy to discover that you can use basic tongue-and-groove flooring to create beautiful DIY wood counters. We have wood counters in our bathrooms and laundry/mud room, and plan to install them in our kitchen in the next few months. For the bathrooms and kitchen, where a smooth finish is necessary, we use Ikea’s butcher-block counters. 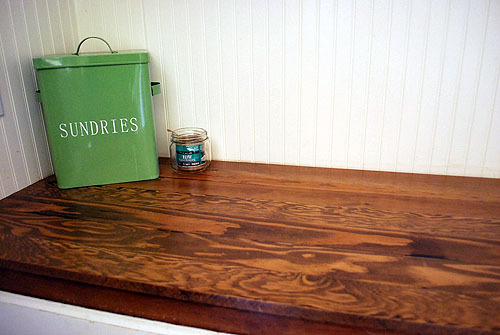 For our laundry/mud room, though, we just wanted a counter that looked nice, but was cheap and easy. So, making the 4-hour-round-trip car-ride (towing a trailer) to our nearest Ikea – easily adding at least $60 to the cost of the counter – was not in the equation. A trip to a local building discount store, however, turned up 6-ft. long pieces of tongue-and-groove fir flooring for only $3.99 each. 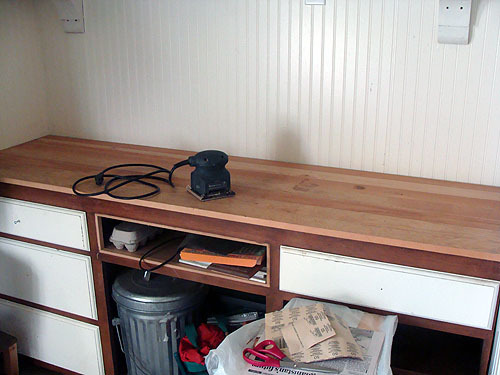 Since we needed seven to cover our base cabinet width (21″) our total for the wood came out to about $28.00 (compared to $59 + $60 for the Ikea butcher block counter). Cha-ching! Any type of basic tongue-and-groove flooring will work for this (our part of the country carries mainly fir – in other areas it’s pine), even used wood flooring, if you can find it for a decent price. And making the counter? It was as simple as gluing the tongues into the grooves and using a clamp to hold them while they dry. A few small nails around the edge and it was ready to be finished – which is another easy couple of steps. I really love how it turned out (though the cabinet itself is not quite finished…eh-hem). 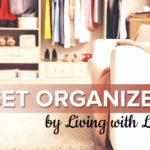 It looks great in the room and has been a good surface for starting plants as well as holding goods for the freezer and baskets of laundry. And it’s got me thinking of all the other things I could use this easy DIY technique on: rehabbing an old side table, dresser, or topping an old table in the garden shed. 1. Cut wood in desired lengths (or if you’ve bought them at a store, have them cut for you). 2. Apply wood glue lightly to one tongue at a time, setting each into a corresponding groove until all the pieces have been used and your desired width is reached. Make sure to wipe away any traces of glue while it’s wet or the stain won’t take in those places. 3. Space bar clamps evenly (we used 3 clamps for our 6-ft. long counter) and tighten to hold all the pieces together securely while it dries. If it seems to want to bow slightly, use something heavy to hold it down, like a brick or piece of wood. 4. After the glue is dry, attach counter to base cabinets with finish nails along side and back edges only, 1/8-1/4″ from edge. 5. Sand counter in preparation for staining. 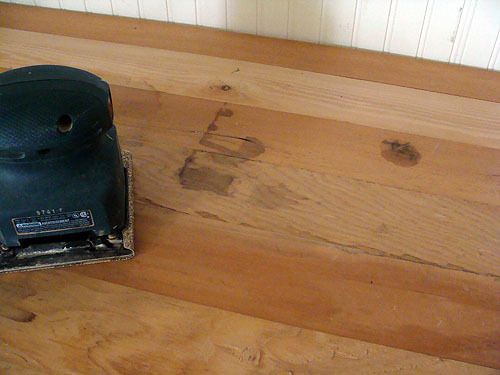 Don’t worry about getting it perfectly smooth – this counter shows its flooring heritage. We actually didn’t finish our counter for about a year after installing it so there were some water stains to deal with- though they were only lightened a bit by the sanding. Hey, more character! 6. 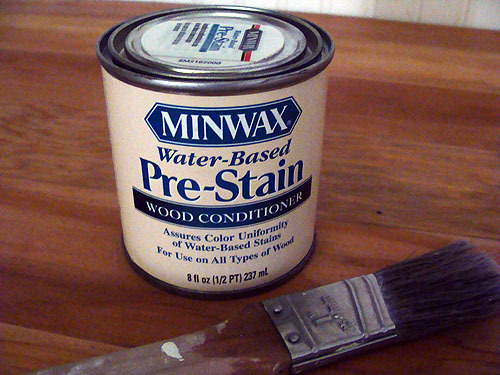 Wipe counters clean and apply a water-based pre-stain wood conditioner according to directions. 7. Apply wood stain according to directions. We used an oil-based stain (that worked with the water-based pre-stain and topcoats) in walnut, so I found it easiest to use a disposable foam brush/applicator. 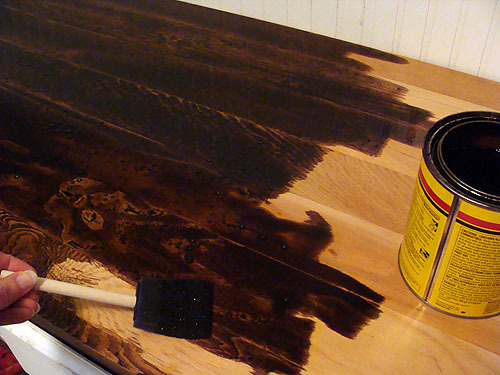 If, after wiping extra and drying, the stain is not as dark as you’d like, apply more coats as desired. 8. 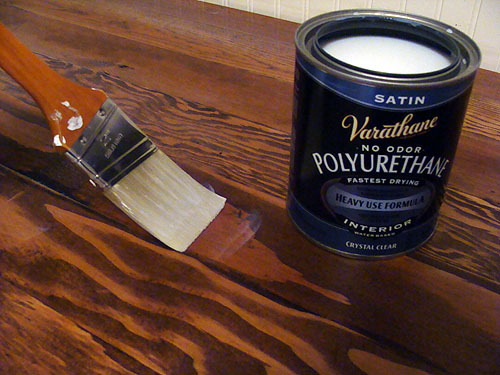 Once the stain is thoroughly dry, begin applying the polyurethane topcoats according to directions. I applied 5 coats total and didn’t sand between coats (I rarely do since none of my projects are about perfection!). Water-based polyurethane only needs 2 hours between coats, so I simply wrapped the brush in a plastic bag until the next coat. 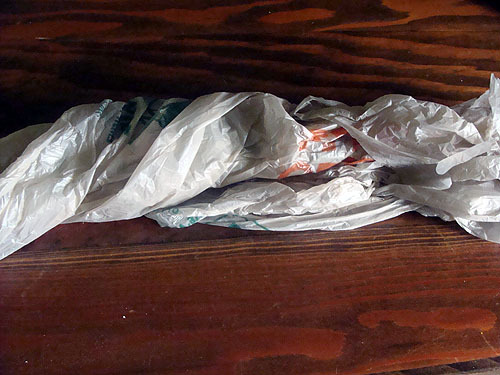 By the way, the counter the bag-wrapped brush is on was created this same way, but about six years ago- in a very busy laundry/mud room area and has held up very well. However, there are a few scratches- and those aren’t much, they really just show up in the photo, and aren’t noticeable in person. 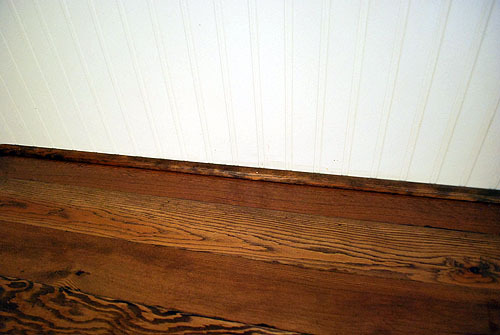 Since we used a dark stain, the nails along the edges aren’t noticeable to us. Thus, we haven’t attached any quarter-round molding to this counter – yet. I think it’s on the agenda…someday. If you’d like to add edging, there are just a few more steps. 1. Cut quarter round molding to fit edges. Use a miter cut for the corners. This is easy using a miter box and saw if you don’t have access to a powered miter saw. 2. Stain molding and finish to match counter. 3. Attach using a thin line of wood glue and a couple of small (1″) finish nails to hold in place. Step back and enjoy your classic wood counter. Your countertops will be full of character for a fraction of the cost of traditional wood counters. 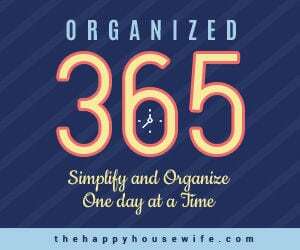 This is a post from contributing writer Jami. Have you tried this with a sink area? I’m quite intrested in this and think it would be lovely idea in my kitchen. I’m not very handy, but if it would hold up I think I could to this project for new counter tops and save money. It is the counter around our laundry room sink, but that sink doesn’t get the daily use that a kitchen sink does. We aren’t very meticulous about sanding and smoothness, so ours aren’t water-tight. If you really sanded them smooth so that all the topcoats would fill in the gaps, they should work. You’d need to be careful not to let water sit on them, and use a topcoat product that is food-safe. You’d probably need to re-coat the counters every few years, too. Hope that helps! Great idea with the countertops. 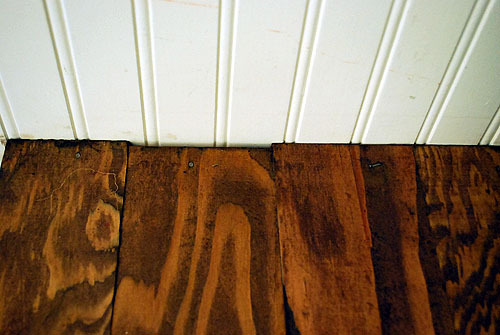 Just wondering what you did for the edges of the hardwood where the tongue and groove is? I see in the pictures it’s gone but what did you do? Was wondering the same thing as John. 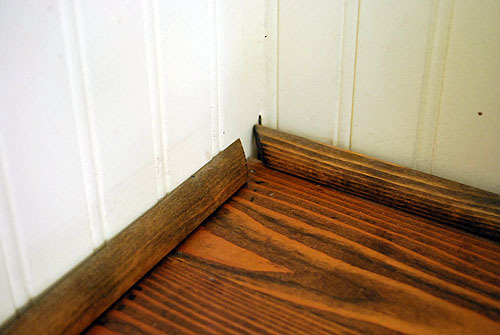 How did you get a flat edge on the outside with the wood being tongue and groove? Thanks. Dude..they cut the tongue or groove off the end of the final piece. No offense at all, but if you’re having concerns like this, it would be in your best interest to hire a professional. Far to often, carpenters/builders spend a great deal of time undoing a homeowners attempt that was over their heads and will cost more than doing it right the first time. 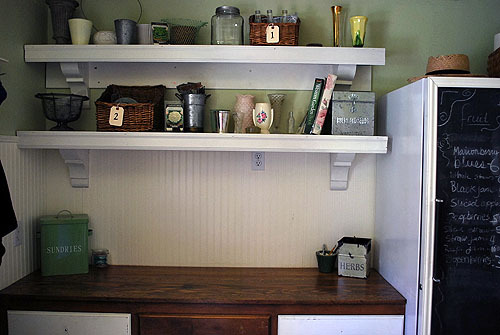 I love this idea as I am remodeling and this would be perfect for my kitchen. However to stand up to wear and tear couldn’t I cover it with a coat of epoxy resin and then add the molding? Kudos to you for a cost effective beautiful idea for a country feel. What do you think about using resin on top? ?